Say Hello to the Sun and to Feeling Great! Sun Salutation (Surya Namaskar) is a perfect warm-up at the beginning of a yoga practice, but it’s a workout on its own too and can be a great way to start the day when you have limited time for exercise. Sun Salutation increases circulation, brings flexibility to the spine and works on the whole body energizing and increasing concentration & focus. It is the perfect little ritual to meet the new morning with gratitude and set the energy and mood for the next activities of your day. Like with all yoga postures, allow at least 2-3 hours after a meal (sun salutations are a great way to start the day before breakfast). Move with your breath, breathing through the nose. 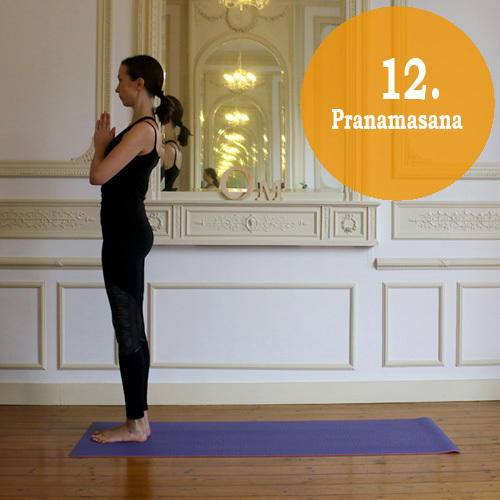 Inhale on the lengthening poses and exhale as your body folds. You can start by practicing each pose individually, staying longer in them to find the perfect alignment and then move on to practicing the whole sequence, allowing your body to flow smoothly from one asana to the other. You can start by doing 3 rounds, and working up to 10-12 rounds. Make sure to protect your knees and elbows making sure they don’t hyper-extend and consult your physician if you suffer from high blood pressure, back injuries or dizziness. Always listen to your body, yoga should be enjoyable, not painful! Ground your feet on the mat, feet together. Engage your thigh muscles to support the knees, engage your abdominal muscles, tuck your pelvis in so that your posture feels straight, awake and supported. Lift your chest, relax your shoulder and align your neck with your spine. Bring your hands to your heart. Exhale through the nose, allowing the belly to relax. Inhale, bring your arms up, pushing the shoulder blades in. Extend your whole body upward. Gently open your chest, bending the upper back while keeping your leg and abdominal muscles engaged to protect your lower back. Exhale, bend forward from the hips, keeping your back straight. Place your hands on the floor or on your ankles or as low along the leg as you can. Look to your knees; pull your abdominal muscles in to create more space. Inhale, step your left leg back, allowing the left knee to rest on the mat while bending the right knee to a 90-degree angle between your hands. Extend your spine, look up, lift your palms up and support with your fingers. Your toes can be tucked in on the mat or extended as in the picture. Exhale, tuck your toes in, step your right leg back and push yourself to mountain pose, or downward facing dog. Hands and feet both hip width apart. Push your pelvis towards the sky, ground the whole of your palms and spread your fingers on the mat, pushing away from your hands to distribute your weight evenly and release the pressure on the wrists. Push you heels towards the ground, allow your head to relax, look to your feet. Inhale, come to push-up position or bring your knees to the mat, swinging your upper body towards your hands. Bend your elbows and with a controlled movement bring your chest and your chin to the mat as you exhale. Keep your elbows close to your body. Keep your toes tucked in at first, before pointing the out toes in plantar flexion as in the picture. Inhale, “dive” into Cobra Pose, keeping your elbows bent and close to your body. You can keep your pelvis and your thighs on the floor, making sure to push your shoulders away from the ears and not letting your back sag. If you feel comfortable, you can straighten your arms and lift your pelvis and thighs off the mat to Upward Facing Dog. Look up. Exhale, bring your chin to your chest, push your pelvis up to Mountain Pose. See step 5. for alignment. Inhale, step your left leg forward between your hands, keeping the left knee at a 90-degree angle, help your leg forward with your hands if needed. Right knee on the floor, lengthen your spine, look up. Exhale, step your right leg forward so that your feet are now together. 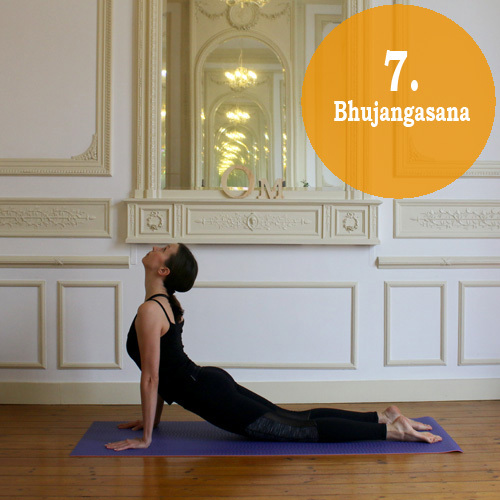 Lengthen your spine, tuck your head looking towards your knees. Exhale, bring your hands to your heart and take a normal breath in and out through the nose before starting the next round.